It’s easier than ever to shop on The Nail Superstore’s website. The online nail supply site has just launched a new and improved site — and responsiveness is key. 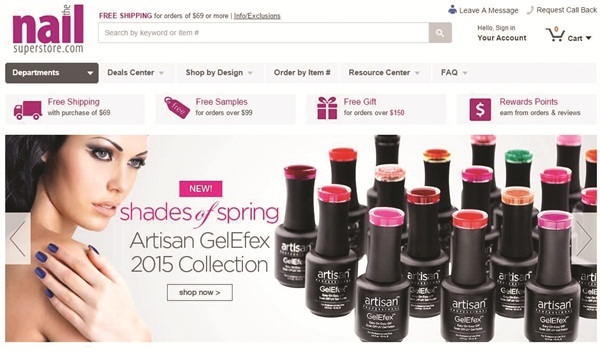 It’s easier than ever to shop on The Nail Superstore’s website. The online nail supply site has just launched a new and improved site — and responsiveness is key. It has been completely overhauled and optimized for touchscreen devices, allowing you to browse more than 3,000 updated product descriptions — or use “smart search” with auto complete. Enjoy the new deal center, sale items, and rewards points just for shopping. Checkout is simple and customers can receive free gifts and free samples. The site also features dozens of new products and new how-to videos from nail art champs Brenda Skermont and John Hauk. Love one of the nail art designs in a how-to nail art video? You can purchase all the products you need in one convenient kit. Check it out at www.nailsuperstore.com.